A SWOT Analysis is a popular strategic planning tool used to evaluate the Strengths, Weaknesses, Opportunities, and Threats involved in any businesses. Using a mind map allows you to collect and structure a lot of information involved in SWOT Analysis as well as identify the relationships between different pieces of information. You can export your SWOT mind map into an MS Word document, which makes using SWOT mind map easier if you need to collaborate it with other people. Reveal the “SWOT and TOWS Matrix” solution. Find it in the Management section. Click the “SWOT Analysis Mind Map” template preview. This will run a ConceptDraw MINDMAP template file. Click the File menu, select Export and then choose MS Word. The Export to Word window will appear. Select template and then click OK. 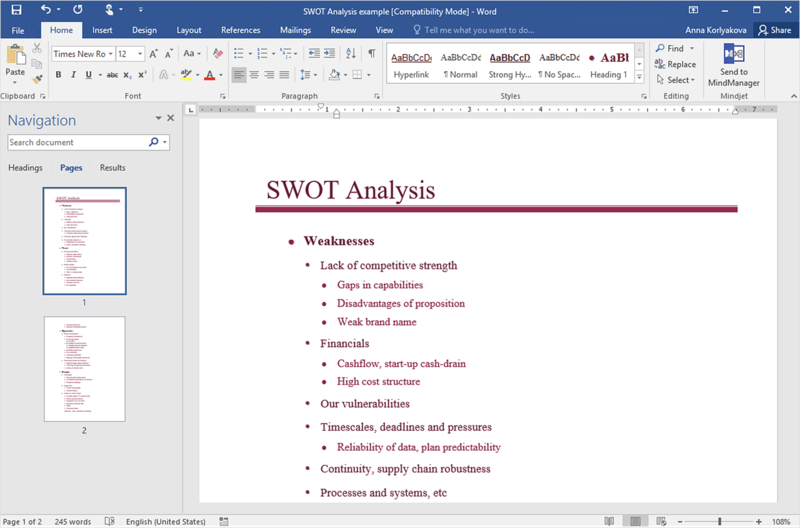 Result: Present and collaborate your business strategic SWOT analysis matrix in MS Word document. ConceptDraw MINDMAP Output plug-in supports data conversion to MS Word® docx format. ConceptDraw MINDMAP Input plug-in supports data conversion from MS Word® docx to cdmz format.